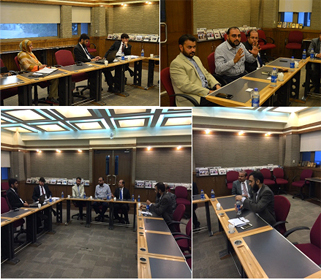 CEIF conducted a session with Key personnel engaged in Marketing of Islamic Finance Products and Services. The purpose of the session was to develop the overall Marketing Strategy in collaboration with industry stake holders. The think tank included Waqas Durrani, DIB; Shahzad Samad, BankIslami; Abdullah Ghaffar, Al Baraka; Mohammed Adil and Farhan Usmani, Meezan Bank; Fawad Bawany, ED Amin Bawany Group; Ahmed Ali Siddiqui, Founding Director of CEIF and Sarwat Ahson, Consultant CEIF. Since the Marketing Consultative Group at CEIF is envisaged to be a platform to liaise with the local market leaders about the future plans, course offerings, collaborations etc., the need for greater inclusion of Islamic Finance sector was felt and the group suggested taking on board Takaful as well as Mudarbah Companies. The Group discussed various issues in the industry and the support that their PR platforms can provide to CEIF. The group exchanged ideas on the mutually beneficial prospects and worked on various options such as career fairs and guest speaker session with International Speakers. The brain storming session was very fruitful in crystalizing the gaps in the industry hence paving way for demand driven offerings by CEIF.